Having a keen interest in Amateur Radio data modes I have for over the past year been using Olivia 16-500 around 5.368 MHz for working other stations within the United Kingdom. I found this mode the most robust and popular, with some PSK31 activity around 5.363 MHz, but not a lot else. I had worked the same stations over and over again (some in excess of 20 times) & was keen to find some 5 MHz DX data activity, but where? Being very familiar with WSJT-X and JTAlert software for JT65/JT9 weak signal data communications on the other HF bands I was initially frustrated to find that the Internationally recommended 5 MHz frequencies for both modes were 5.357-5.359 MHz for JT65 and 5.359-5.361 MHz for JT9 signals, which looked at first glance to be outside our UK 5 MHz band segments. However, on closer inspection I noticed that our 5.354-5.358 MHz UK band segment did overlap very slightly with the International one and with careful tuning it would be possible to just fit in some 200 Hz wide JT65 signals between 5.357-5.35780 MHz. See table below. Using a combination of CQ calls and posts on the chat pages of Hamspots I was able within a few days to generate considerable activity in this area as word spread to other UK Radio Amateurs that they too could work DX here using JT65 mode, so long as they were very careful not to go higher than 5.35780 MHz. It was also a revelation for DX stations to find UK activity where they could work it. It has been interesting to observe when the 5 MHz band has been open to which DX Countries with a clear higher chance for catching US stations from around 22:30 UTC onwards, although they can be worked up to around 09:00 but that is the middle of the night for them. 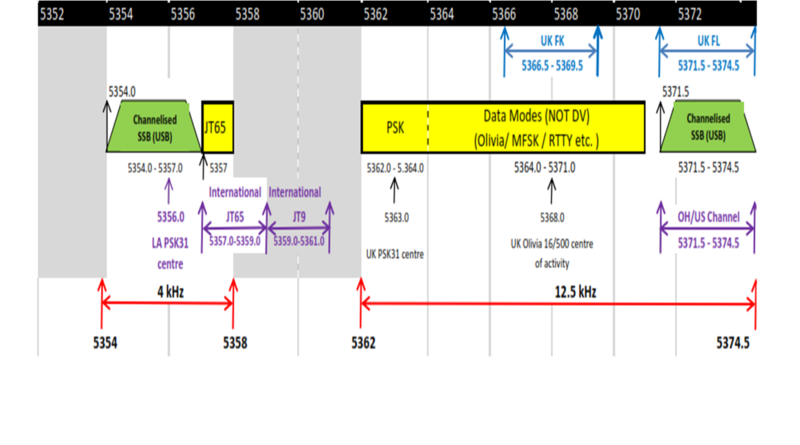 If UK SSB speech users can be encouraged to use 5.354 MHz USB dial for their voice communications rather than 5.355 MHz USB then it avoids any conflict and allows simultaneous SSB voice and JT65 to co-exist harmoniously in the only small sliver of shared JT65 International spectrum. The Cluster spots are full every day of International Amateur Radio JT65 data stations all in the range 5.357-5.359 MHz. This entry was posted in Amateur Radio and tagged 5 MHz, Data modes, DX, JT65, JT9, JTAlert, WSJT, WSJT-X. Bookmark the permalink.